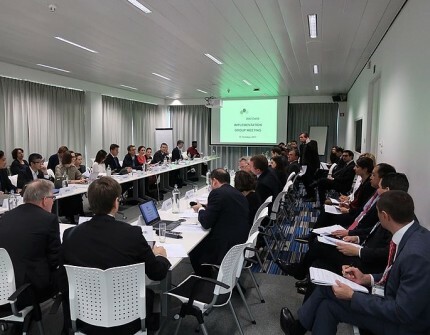 The last Strategy Group Meeting under the 2017 Turkmen Chairmanship took place on 19-20 October at the Energy Charter Secretariat in Brussels. It addressed fundamental issues such as the Ashgabat Declaration to be adopted at the ministerial meeting end of November, modernisation of the ECT, the implementation of the policy on consolidation and expansion, and the flagship publication Energy Investment Risk Assessment (EIRA). Three presentations were devoted to the special cooperation with China, Iran and Nigeria. Another important topic was discussion of external communication regarding vision, mission and objective statements. Finally, delegates tackled organisational aspects such as the objectives and tasks of the Strategy and Implementation Group and the need to designate Enquiry Points in capitals. The day before, the Implementation Group met to finalise their discussions on the Handbook on general provisions applicable to investment agreements in the energy sector, which was designed as a non-legally-binding tool to help and empower governments in their negotiations of complex investment agreements in the energy sector. Similarly, the group discussed the report on potential standardisation of LNG contracts prepared with the support of the industry and legal experts, which concluded that certain key trends and issues could be addressed by standard provisions, rather than developing an entire model LNG contract at this stage. In addition, the Implementation Group finalised discussions and supported the first edition of the Investment Facilitation Toolbox, which sets non – binding policy guidance for investment facilitation in the pre-establishment phase. Regarding transit, delegations asked the Secretariat to focus its work on a set of soft law instruments to address transit issues. Finally, the group discussed the In-depth energy efficiency review for Kyrgyzstan as well as large-scale energy efficiency investment and finance (in particular regarding demand-side energy efficiency investment).